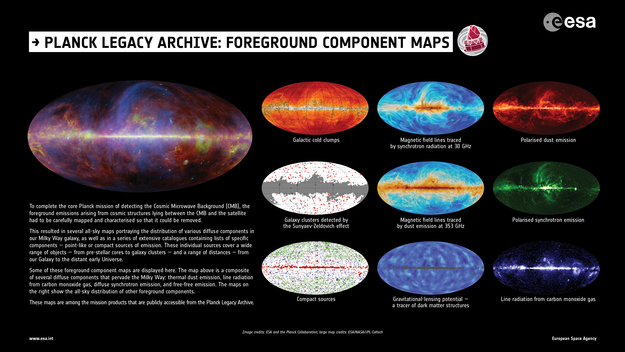 To complete the core Planck mission of detecting the Cosmic Microwave Background (CMB), the foreground emissions arising from cosmic structures lying between the CMB and the satellite had to be carefully mapped and characterised so that it could be removed. This resulted in several all-sky maps portraying the distribution of various diffuse components in our Milky Way galaxy, as well as in a series of extensive catalogues containing lists of specific components — point-like or compact sources of emission. These individual sources cover a wide range of objects — from pre-stellar cores to galaxy clusters — and a range of distances — from our Galaxy to the distant early Universe. Some of these foreground component maps are displayed here. The large map is a composite of several diffuse components that pervade the Milky Way: thermal dust emission, line radiation from carbon monoxide gas, diffuse synchrotron emission, and free-free emission. The small maps on the right show the all-sky distribution of other foreground components. From top to bottom, left to right: Galactic cold clumps; galaxy clusters detected by the Sunyaev-Zeldovich effect; compact sources; magnetic field lines traced by synchrotron radiation at 30 GHz; magnetic field lines traced by dust emission at 353 GHz; gravitational-lensing potential — a tracer of dark matter structures across the Universe; polarised dust emission; polarised synchrotron emission; and line radiation from carbon monoxide gas.